Check out the link below from Dr. Dobb’s site written by Dr. James McCaffrey for different ways to parse XML files. I set out to determine how many different ways there are to parse XML using .NET and to understand the pros and cons of each technique. After some experimentation, I learned that there are five fundamentally different ways to parse XML, and that the “best” method depends both on the particular development situation you are in and on the style of programming you prefer. After I explain each technique so you can modify my examples to suit your needs, I will give you guidance on which technique should be used in which situation. Knowing these five methods for parsing XML files will be a valuable addition to your .NET skill set. I’m assuming that you’re familiar with C#, VS.NET, the creation and use of class libraries, and have a working knowledge of XML files. Let’s examine the testCases.xml file that we will use for all five parsing examples. The file contents are shown in Listing One. Note that each of the three test cases has five data items: id, kind, arg1, arg2, andexpected. Some of the data is stored as XML attributes (id and kind), and arg1 and arg2are stored as XML elements two levels deep relative to the root node (suite). Extracting attribute data and dealing with nested elements are key tasks regardless of which parsing strategy we use. Because four of the five techniques will use these definitions, for convenience we can put the code in a .NET class library named “CommonLib.” A TestCase object will hold the five data parts of each test case, and a Suite object will hold a collection of TestCase objects and provide a way to display it. Of the five ways to parse an XML file, the most traditional technique is to use theXmlTextReader class. The example code is shown in Listing Three. The Read() method advances one node at a time. Unlike many Read() methods in other classes, the System.XmlTextReader.Read() does not return significant data. TheReadElementString() method, on the other hand, returns the data between the begin and end tags of its argument, and advances to the next node after the end tag. Because XML attributes are not nodes, we have to extract attribute data using the GetAttribute()method. Parsing an XML file with XmlTextReader has a traditional, pre-.NET feel. You walk sequentially through the file using Read(), and extract data with ReadElementString() andGetAttribute(). 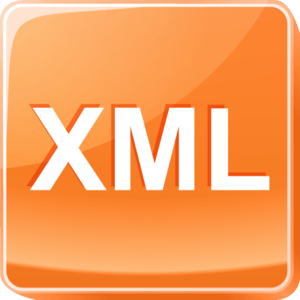 Using XmlTextReader is straightforward and effective and is appropriate when the structure of your XML file is relatively simple and consistent. Compared to other techniques we will see in this article, XmlTextReader operates at a lower level of abstraction, meaning it is up to you as a programmer to keep track of where you are in the XML file andRead() correctly. The second of five ways to parse an XML file is to use the XmlDocument class. The example code is shown in Listing Four. XmlDocument objects are based on the notion of XML nodes and child nodes. Instead of sequentially navigating through a file, we select sets of nodes with the SelectNodes()method or individual nodes with the SelectSingleNode() method. Notice that because XML attributes are not nodes, we must get their data with an Attributes.GetNamedItem()method applied to a node. In this statement, n is the <inputs> node; ChildNodes.Item(0) is the first element of<inputs>, i.e., <arg1> and InnerText is the value between <arg1> and </arg1>. 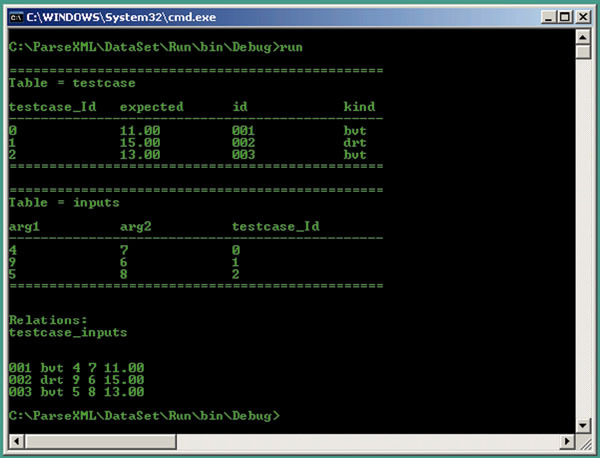 The output from running this program is shown in Figure 3. Notice it is identical to the output from running the XmlTextReader technique and, in fact, all the other techniques presented in this article. The XmlDocument class is modeled on the W3C XML Document Object Model and has a different feel to it than many .NET Framework classes that you are familiar with. Using theXmlDocument class is appropriate if you need to extract data in a nonsequential manner, or if you are already using XmlDocument objects and want to maintain a consistent look and feel to your application’s code. Let me note that in discussions with my colleagues, there was often some confusion about the role of the XmlDataDocument class. It is derived from the XmlDocument class and is intended for use in conjunction with DataSet objects. So, in this example, you could use theXmlDataDocument class but would not gain anything. The third technique to parse an XML file is to use the XPathDocument class. The example code is shown in Listing Five. Using an XPathDocument object to parse XML has a hybrid feel that is part procedural (as inXmlTextReader) and part functional (as in XmlDocument). You can select parts of the document using the Select() method of an XPathNavigator object and also move through the document using the MoveNext() method of an XPathNodeIterator object. The XPathDocument class is optimized for XPath data model queries. So using it is particularly appropriate when the XML file to parse is deeply nested or has a complex structure. You might also consider using XPathDocument if other parts of your application code use that class so that you maintain a consistent coding look and feel. The fourth technique we will use to parse an XML file is the XmlSerializer object. The example code is shown in Listing Six. I created a class library named “SerializerLib” to hold the definition for a Suite class that corresponds to the testCases.xml file so that the XmlSerializer object can store the XML data into it. The trick, of course, is to set up this Suite class. Creating the Suite class is done with the help of the xsd.exe command-line tool. You will find it in your Program Files\Microsoft Visual Studio .NET\FrameworkSDK\bin folder. I used xsd.exe to generate a Suite class and then modified it slightly by changing some names and adding aDisplay() method. The screen shot in Figure 4 shows how I generated the file testCases.cs, which contains aSuite definition that you can use directly or modify as I did. Listings Seven and Eight show the classes generated by XSD and my modified classes in the SerializerLib library. // This source code was auto-generated by xsd, Version=1.0.3705.288. Using the XmlSerializer class gives a very elegant solution to the problem of parsing an XML file. Compared with the other four techniques in this article, XmlSerializer operates at the highest level of abstraction, meaning that the algorithmic details are largely hidden from you. But this gives you less control over the parsing and lends an air of magic to the process. Most of the code I write is test automation, and using XmlSerializer is my default technique for parsing XML. XmlSerializer is most appropriate for situations not covered by the other four techniques in this article: fine-grained control is not required, the application program does not use other XmlDocument objects, the XML file is not deeply nested, and the application is not primarily an ADO .NET application (as we will see in our next example). The fifth and final method we will use to parse an XML file into memory uses the DataSetclass. The example code is shown in Listing Nine. We start by reading the XML file directly into a System.Data.DataSet object using theReadXml() method. A DataSet object can be thought of as an in-memory relational database. The XML data ends up in two tables, “testcase” and “inputs,” that are related through a relation “testcase_inputs.” The key to using this DataSet technique is to know the way to determine how the XML data gets stored into the DataSet object. Although we could create a custom DataSet object with completely known characteristics, it is much quicker to let the ReadXml() method do the work and then examine the result. I wrote a helper function DisplayInfo() that accepts a DataSet as an argument and displays the information we need to extract the data from the DataSet‘s tables. To keep the main parse program uncluttered, I put DisplayInfo() into a class library named “InfoLib.” The code is shown in Listing Ten. The output from running the parse program is shown in Figure 5. The first table, “testcase,” holds the data that is one level deep from the XML root: id, kind, and expected. The second table, “inputs,” holds data that is two levels deep: arg1 and arg2. In general, if your XML file is n levels deep, ReadXml() will generate n tables. Using the DataSet class to parse an XML file has a very relational database feel. Compared with other techniques in this article, it operates at a middle level of abstraction. TheReadXml() method hides a lot of details but you must traverse through relational tables. Using DataSet to parse XML files is particularly appropriate when your application program is using ADO .NET classes so that you maintain a consistent look and feel. Using a DataSetobject has high overhead and would not be a good choice if performance is an issue. Because each level of an XML file generates a table, if your XML file is deeply nested then usingDataSet would not be a good choice. There are several related issues not yet covered: namespaces, generalization, error handling, validation, filtering, and performance. In the context of parsing XML data files, XML namespaces are a mechanism to prevent name clashes. Each of the techniques we’ve used can deal with namespaces. The MSDN Library will give you all the information you need to handle XML files with namespaces. Additionally, I didn’t address XML validation with schema files, but once again, in a production environment you would need to generate XML schema files and validate your XML data files against them before attempting to parse. It is possible to add validation to your parsing code, but I recommend validating before parsing. If performance is an issue — usually in the case where you are parsing many small XML files — you will have to run some timing measurements to determine if your chosen technique is fast enough. Performance is too tricky to make many general statements and the only way to know if your performance is acceptable is to try your code. As a guideline, however, XmlTextReaderhas the best performance characteristics. XML data files are a key component of Microsoft’s .NET developer environment. The ability to parse data from XML files into memory is a key skill in a .NET setting. Each of the five techniques, based on the XmlTextReader, XmlDocument, XPathDocument, XmlSerializer, and DataSet classes, is significantly different in terms of coding mechanics, coding mind set, and scenarios for usage. The .NET Framework gives you great flexibility in parsing XML data files and makes this essential task much easier and less error prone than using non-.NET techniques.